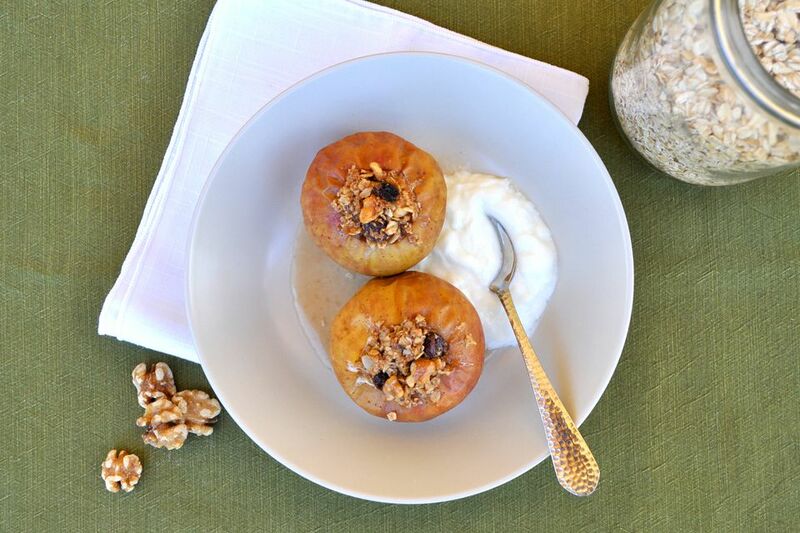 Apples are delicious on oatmeal or granola, so why not switch things up, and instead of topping your breakfast oats with apple, top your apple with oats? It's a great way to use up farm-fresh apples, and a great way to start a chilly day. And while stuffed apples are nutritious enough for breakfast, they make a nice light dessert, too. This recipe makes four to six apples depending on the size of your fruit. If you've got big apples, you'll just need four. If you've got smaller apples, plan to use six. Raisins and walnuts add texture along with sweet and nutty flavor to the pretty dish. Serve them warm with plain yogurt for a lightly sweet and perfectly spiced breakfast treat. Using an apple corer, melon baller or small knife, remove or scoop out the seeds and core each apple almost to the bottom, leaving the very bottom of the apple so that the filling doesn't fall out. In a small mixing bowl, combine the oats, sugar, raisins, walnuts, cinnamon, nutmeg and salt. Add the butter and use your hands to squeeze the mixture, mixing it in with the dry ingredients until a crumble is formed. Fill each apple core to the top, lightly packing the filling. Place the apples in a 8" or 9" baking pan with sides. Add the hot water or cider to the pan, avoiding the tops of the apples, and cover with aluminum foil. Bake for 30 minutes. Remove the foil and bake for 10 to 20 more minutes, or until the apples are easily pierced with a knife and the topping is browned. Serve warm. Top with yogurt if desired. Swap out the butter for vegan butter to make this dish vegan. Be sure to use gluten-free oats for a totally gluten-free dish.